Ella's Lead Review: Happy Human Customer! Another awesome review! Only this time, it's for a human! Becca from ohwto.com (check out her site, she makes AMAZING indie soaps and oil perfumes!) did a review on Ella's Lead! Becca was ecstatic when she received a bracelet hand made by us. So much so, she raved about it on her blog "I Squee'd": Ella's Lead and the Bracelet of Win. We are very happy that you love your bracelet! Ella's Lead: Give Away time!!!! Since Facebook no longer allows contests, we have decided to host them here on our site. 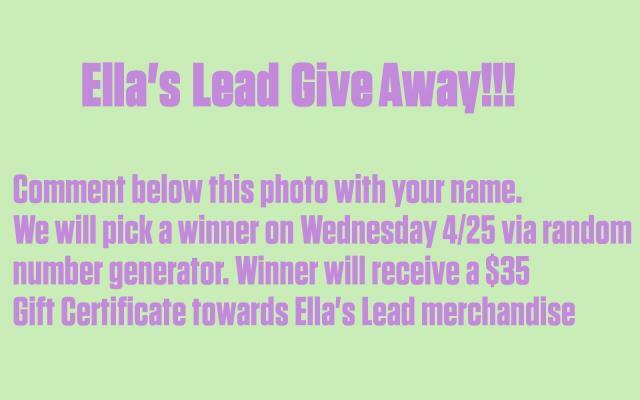 Comment below to enter for your chance to win a $35 GC from Ella's Lead. Winner will be chosen on Wednesday, 4/25/12 via random number generator. CONTEST CLOSED. The winner is Ros-Mari Gloria Nødland! Ros-Mari, please email us at orders@ellaslead.com for your checkout code. Thanks everyone!